DGO DGO | Overlooking Laurel & Hardy biopic “Stan & Ollie” was a big mistake. Huge. While watching the new Laurel & Hardy biopic “Stan & Ollie,” I kept thinking about the cliché of “Hollywood biopic formula,” which was famously lampooned in “Walk Hard: The Dewey Cox Story” (2007). Coincidentally, both films star John C. Reilly, and the latter has been brought up a few times recently thanks to the string of biographical pictures released this season. Bryan Singer’s “Bohemian Rhapsody” – which told the supposed story of rock band Queen’s history, was a film that did very well at the box office last fall, but landed in a mediocre position with critics. The most common complaint was that the team behind the movie kept the script too safe, with many biopic clichés of the rise and fall of an icon. Drug problems and estranged relationships all came with some cheesy dialogue and poor execution, yet it made a ton of money, essentially because, “Hey, the music sounds great with the theater’s sound system.” There were Online comments and posts comparing “Walk Hard” and “Bohemian Rhapsody” for having the same story structure, except while “Walk Hard” was a farce, “BoRhrap” was dead serious. Another baffling hit this Oscar season is Peter Farrelly’s foray into dramas, “Green Book.” The movie is based loosely on the real events that took place between pianist Don Shirley and driver Tony Lip in 1962, and got mixed reviews of criticisms for simplifying a harsh period in Civil Rights history for the sake of a lighthearted feel. 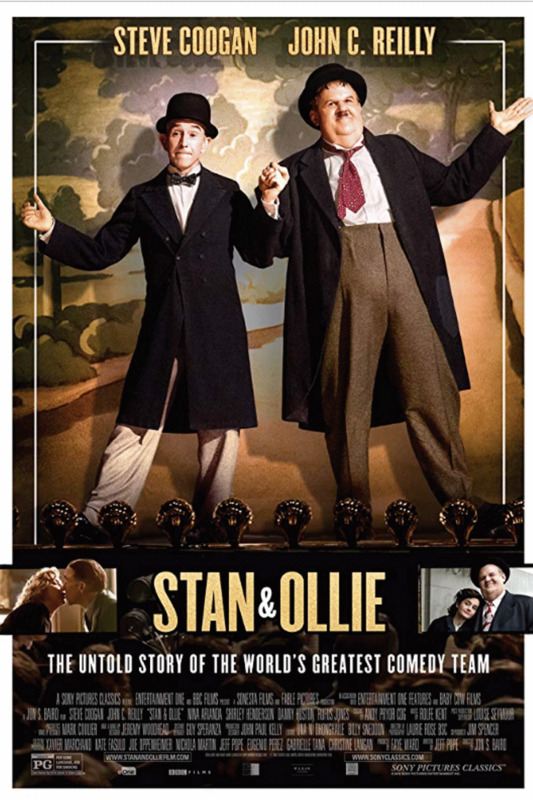 Meanwhile, Jon S. Baird’s “Stan & Ollie” does none of this, as it specifically focuses on Stan Laurel and Oliver Hardy’s close partnership and friendship over two years of their careers. It’s one of the most charming films released this season. I realize that a lot of the best biopics aren’t portraying life stories, but are studies on specific periods of the subject’s career or life instead. Not every real life story can be as good as “Coal Miner’s Daughter” (1980) or “GoodFellas,” (1990) or even “What’s Love Got to Do with It” (1993) on the big screen. Some are like “Bonnie & Clyde” (1967), “Catch Me If You Can,” (2002) and “24 Hour Party People” (2002), and are content to do their own thing, focusing on specific episodes of the subjects’ lives. “Love & Mercy,” (2014) a film on Brian Wilson of the Beach Boys, wasn’t perfect (John Cusack was particularly miscast), but the parts that were good almost made up for it (i.e. all of the flashbacks featuring Paul Dano). And, it’s important to remember that no biopic, no matter how expertly crafted or acted, will ever be 100 percent accurate regarding the subject’s history. James Mangold’s “Walk the Line” (2005), also one of the big influences for “Walk Hard,” took some liberties portraying Johnny Cash’s first marriage for the sake of narrative progression. Still, the performances by Joaquin Phoenix and Reese Witherspoon, coupled with Mangold’s cinematic style and Cash’s classic songs, make it work. It’s possible that as more and more life stories have landed on screen, viewers have become burned out on biopics. Or maybe Green Book’s Farrelly or BoRhap’s Bryan Singer are just seen as hacks now. Whatever the case, Jon S. Baird was unfairly shafted by “Stan & Ollie” getting overlooked.